New Jersey Gov. Chris Christie announced he was firing his education commissioner Friday, days after it was revealed that a simple mistake on an application form might have cost the state a $400 million education grant. The dismissal of Commissioner Bret Schundler comes after New Jersey became the top runner-up for the Race to the Top grants, missing out by only a few points. The Star-Ledger of Newark later reported that budget figures for the wrong years were supplied in one section of the application. Christie had defended Schundler on Wednesday, saying he gave the federal government the missing information during a meeting in Washington this week. But a video released Thursday by the federal Education Department shows that wasn't the case. "I was extremely disappointed to learn that the videotape of the Race to the Top presentation was not consistent with the information provided to me by the New Jersey Department of Education and which I then conveyed to the people of New Jersey," Christie said in a statement Friday. "As a result, I ordered an end to Bret Schundler's service as New Jersey's Education Commissioner and as a member of my administration." Schundler, a former Jersey City mayor and gubernatorial candidate, is an outspoken proponent of educational reform and was an unconventional choice as a member of the governor's cabinet. There was tension between Schundler and Christie, both Republicans, earlier over the Race to the Top application. Schundler made compromises on the proposal to win the endorsement of the New Jersey Education Association, the state's main teachers union. On Tuesday, the Education Department announced that nine states and the District of Columbia had won coveted Race to the Top grants aimed at sparking major educational overhauls. In its application New Jersey had given budget figures for fiscal years 2010 and 2011, where the application called for data from 2008 and 2009. On Wednesday Christie said Schundler tried to correct the error during an August 11 presentation to a federal panel that was judging the application. "During that interview this issue was raised, and Commissioner Schundler gave them, in the interview, the numbers for '08-'09 because the mistake was raised," he said. "But they still didn't give us the credit for the points." If the points had not been docked, New Jersey's application may have finished ahead of Ohio's. Christie accepted responsibility for the error, but he also blasted the Obama administration for docking the state precious points in its evaluation for what he called a "clerical error" on an otherwise strong application. "That's the stuff that drives people nuts about government," Christie said at the press conference Wednesday, "and that's the stuff the Obama administration should answer for, are these guys there checking boxes like mindless drones." Yesterday the federal Department of Education released video of the Aug. 11 presentation. The video seems to contradict Christie's account of the data being provided on the spot. In the video, a panelist points out the error and asks for the correct data. Schundler is asked if he could explain the discrepancy or if the missing data has been located. Schundler and another official seated at his left appear to struggle to come up the numbers, flipping through binders on the table. The official says, "No, I cannot." When a questioner suggests to Schundler that "We can come back to that," he replies, "That would be helpful." 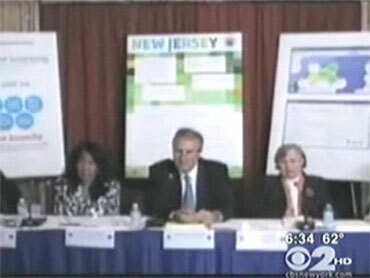 A federal official said New Jersey education officials never provided the requested information. A spokesman for the state's largest teachers' union says this newly released video shows the blame for losing $400 million in federal assistance clearly lies with the New Jersey governor and not with the union or the Obama administration. During a radio interview Thursday Christie said his comments were based on information given to him by those who were involved with the meeting, whom he says told him they had verbally provided the information requested by the federal government. According to CBS Station WCBS correspondent Magee Hickey, Christie said that he would be "seriously disappointed" if what he first heard from his administration officials about the snafu turns out to be untrue. But he said he would not officially comment on the video until he had seen it. Today he officially announced Schundler was fired.